News of a fish kill on my local river was met by disbelief this week. A tank containing toluene, a toxic industrial paint stripper, had leaked at a business unit in the town and the chemical had been washed down a surface drain during heavy rain. A chemical with the ability to cause nausea and sickness, toluene can mix with water if agitated, which it did, when it passed over a series of small weirs. 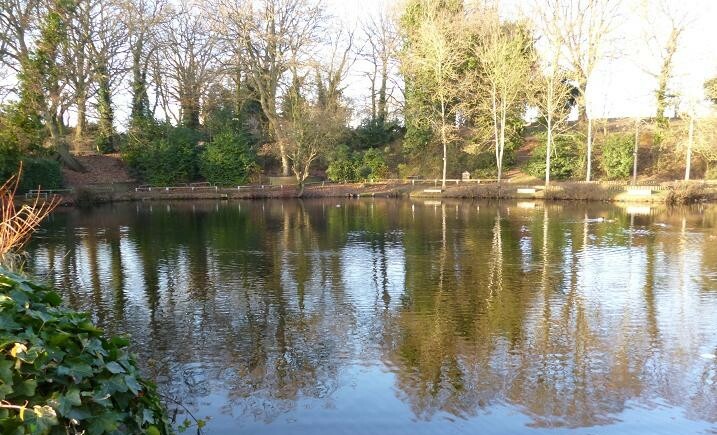 The Environment Agency was alerted by members of the public complaining of the strong heady smell coming from the river, which was traced back to the surface water drain from the town. Due to the high flow levels, banks were awash and there were no early signs of fish being affected, but as the river settled back down to normal, dead fish were washing up five miles downstream. In denial that my regularly fished stretch could have been a victim of the pollution, I decided to put it to the test, setting up my tackle a hundred yards from the outfall. The river looked perfect, with a hint of green colour and I set up a stick float rig ready to trot the opposite bank among the roots along the overhang. Preparing for my first cast, I noticed that there was a smell of oil in the air, while underfoot the bank had a slimy covering. Not good. 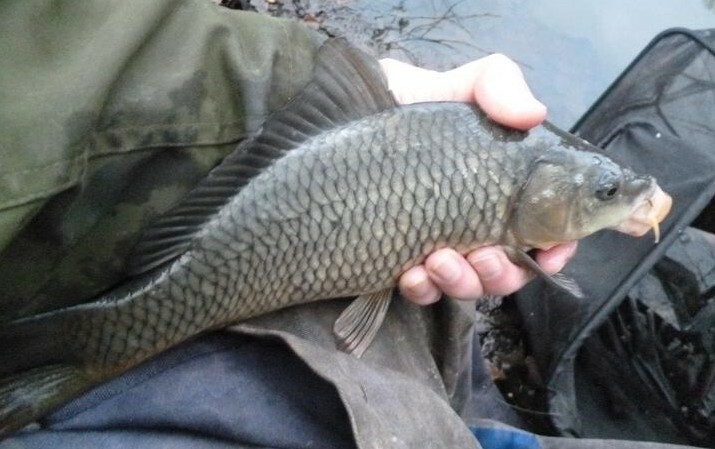 My most successful winter method in this swim, is to fish a 5 mm bread punch pellet on a size 16 hook with liquidised bread feed and expect a bite, usually from a chub, first cast. Not a touch. The float drifted 10 yards before I retrieved it, the bread pellet still on the hook. Another ball of bread was followed down by the float with the same result. With another ball put in just beyond the middle, I adjusted another six inches on the depth and followed the cloud down holding back at intervals in search of the obliging roach. Again nothing, my only sign being a slow pull under, but the strike revealed a twig dragged up from the bottom. The last resort was to set the float even deeper to lay on with the rod rested, surely a gudgeon would take the bread, these small fish a curse once they move in over the feed as it settles on the bottom. By now there would be a dozen, or more fish in the net, but now there were none. In that disappointing 30 minutes, the realisation that the river was devoid of living fish, had struck home and pulled in my empty keep net. As it disturbed the bottom, a mini oil slick rose to the surface. Packing up, I scraped the sticky mud from my boots and walked my trolley downstream in search of evidence of fish mortality. From the high bank my eyes soon attuned to the ghostly pale outlines of dead fish, trapped on under water obstacles, strung out like grim necklaces. 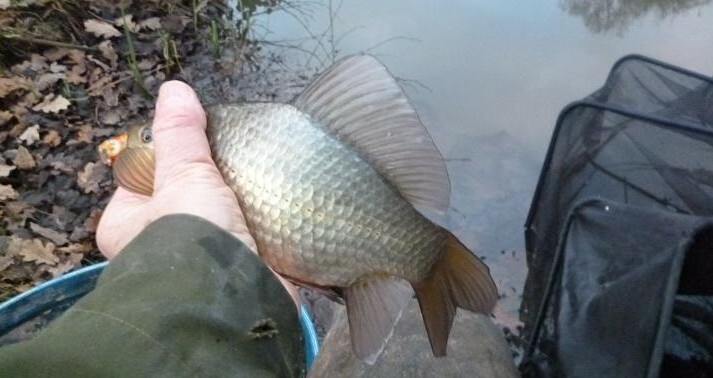 On the bank opposite, a 3 lb chub lay stranded by the flood, it’s silver flanks holed by birds, or rats. Further down this sickening sight was waiting, fish caught among the reeds as they were washed down stream, here roach, chub and perch just a snapshot of the carnage. What next? 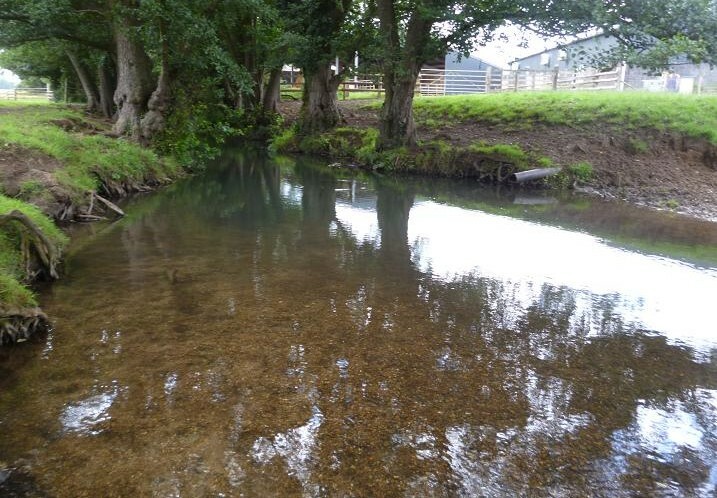 This small river was already the focus of work between the town council and the environment agency for improvement, tree cutting, flow improvement and the creation of safe fishing platforms already in the pipeline. This work could be carried out as per schedule in the next few months, only for anglers to find little, or nothing to catch. Once the river environment is considered safe to restock, it will take years to recover to the level of the past few seasons. Catches like this above, chub and roach taken on the stick float with bread punch from the very swim that drew a blank during my test session this week, or the one below, when maggot and caster resulted in a mixed bag of roach, rudd, chub and perch, which was topped off by a 2 lb bream are now consigned to history. Having moved into the area six years ago, I was amazed by the quantity and variety of fish in this unobtrusive little river and was quite smug in emails to angling friends struggling to catch on the river Thames, where I used to live. My emails grew into regular blogs, never failing to fill a net in just a few hour’s fishing. Roach like this one were every other cast and it is heart breaking to know that this healthy fish now lies dead in the mud, due to human failings. If there is a financial settlement, it will never compensate for the loss of a fishing gem. 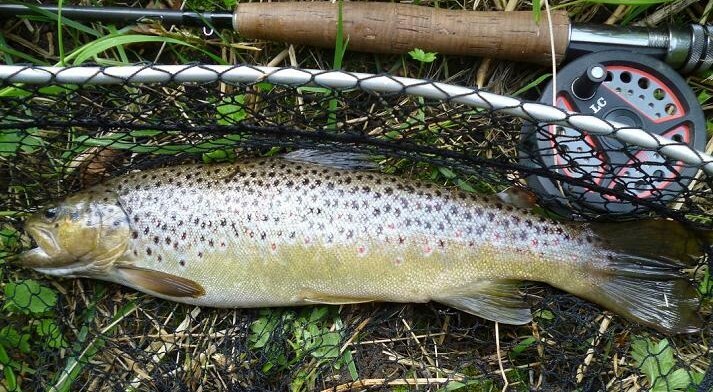 Following up on my recent syndicate trout stream working party, I travelled back to see for myself the improvements that the farmer had carried out during the close season, without consulting the anglers as to the effects on the fishing. The fishing lease was signed many years ago, long before the current occupier took over the farm from his aging father, who had left the river management to the anglers, but in recent times the new broom has been working hard to maximise the financial return from the land. 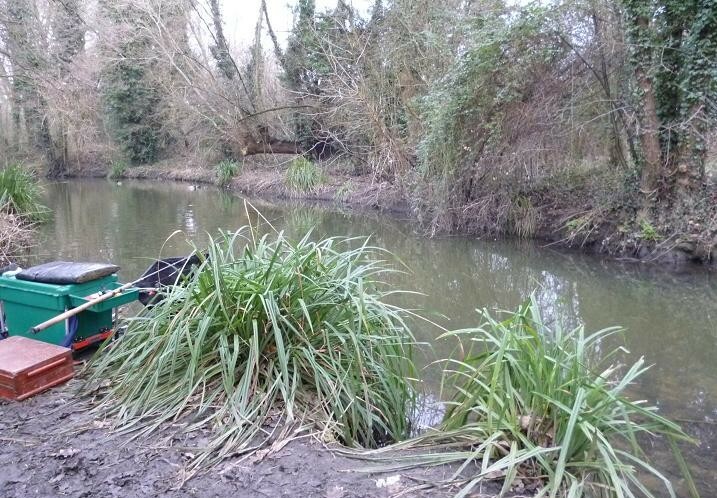 The lease allows for six feet from river to field, but barbed wire and electric fences have been placed on the very lip of the banks, preventing anglers from fishing these areas without waders. My first season was fished without waders, being able to cast and land fish from these same inaccessible banks. With this in mind, I was worried as to what would be waiting, when I reached the new farm bridge. With farming equipment getting bigger every year, the old bridge was past it’s sell by date, being constructed of old railway lines and wooden sleepers. Now constructed of girders and steel plates, the bridge has grown in width, while it’s span has been stretched by about six feet, the old supporting banks replaced by large concrete blocks. 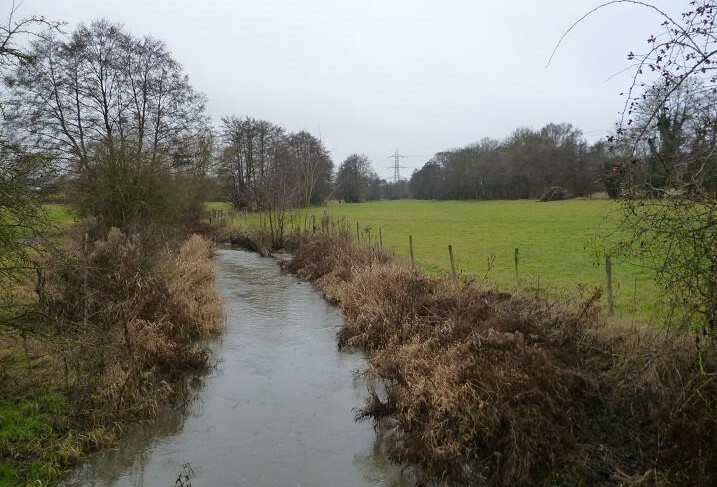 To achieve this, the river upstream had been diverted down an old mill race, reducing the flow to a trickle, while the construction work was carried out, displacing many of the fish stocks. 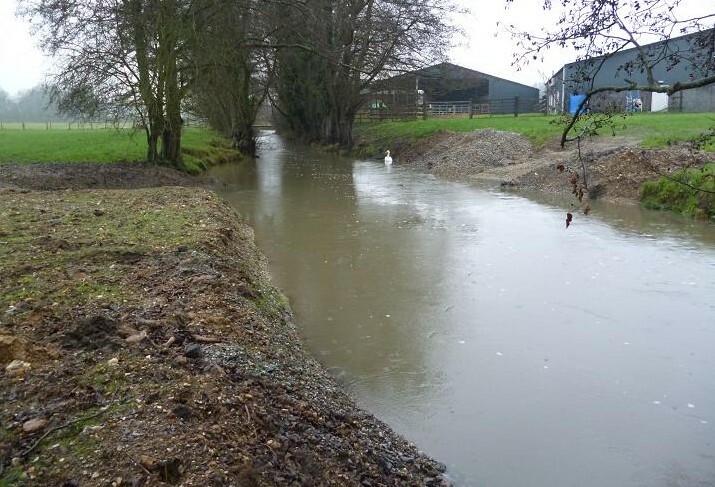 Always worried about flooding around the farm buildings, the river can now pass unrestricted downstream. A view of the old bridge showing the wide support buttresses, which restricted the flow, then accelerated it through the arch, creating a long deep pool at it’s exit and generous slacks at the sides. 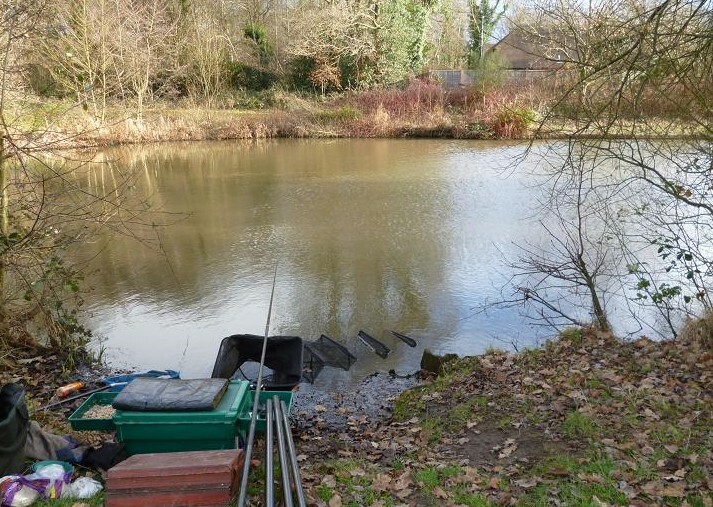 This was one of the best holding areas on the fishery. With no change in the flow, the pool will soon silt up to be replaced by fishless shallows, as is the case just upstream of the current bridge. I wonder whether I will see a trout like the one above again, which took a fly from the surface, deep in the shadow of the old bridge, landing it a triumph during my first season on the water. I now walked down to the old cattle drink, where using a mechanical digger the farmer had dug out gravel from the shallows at the tail of the upstream pool to make up the banks. Looking more like a canal, than a chalk stream, the once wide gravel run is now deep and slow moving, in contrast to it’s previous form. 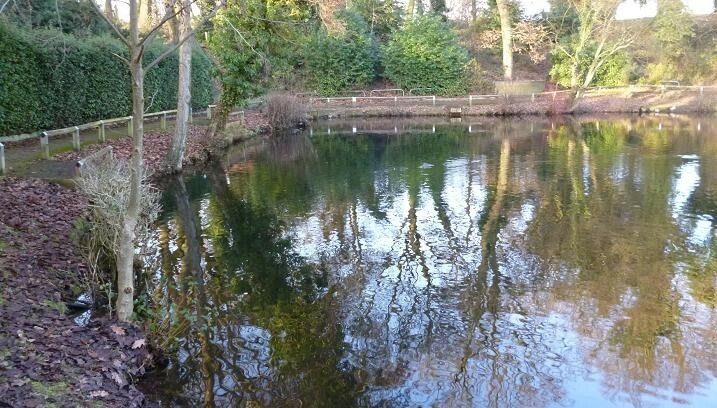 Providing that these new banks do not sprout more electric fencing, this now extended pool could actually improve the fishing in time, although all the existing underwater fly life has been dug out and heaped upon the banks. These shallows tapering back into the pool above used to hold many trout, the wild brown below also taken during my first season on the river from this very spot. There are still two more working parties before the start of the season, when it is intended to work on a neglected stretch, where willows have grown out across the river, restricting the flow, while giving a safe haven for pike and mink. I don’t think that the river will return to the glory days overnight, but providing the farmer lets us get on with it, we can begin the recovery and in the words of the song, things can only get better. Can’t they? January is known as the most depressing month; the Christmas and New Year celebrations are history, while many cold and wet days are ahead, before the early signs of Spring banish the Winter Blues. 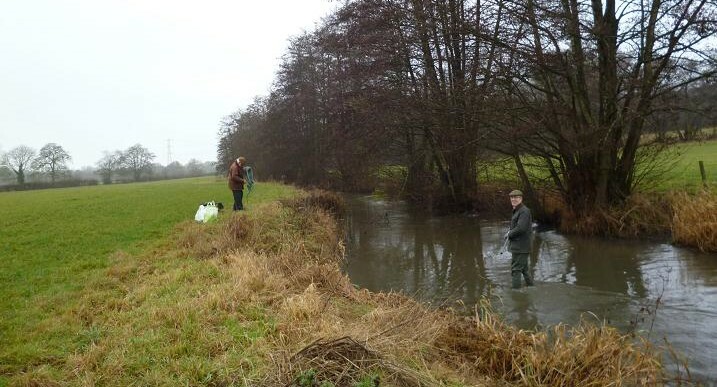 With the first working party date reached in my diary, I was keen to get down to my syndicate trout stream, to see what work was needed to make 2017 better than last year. 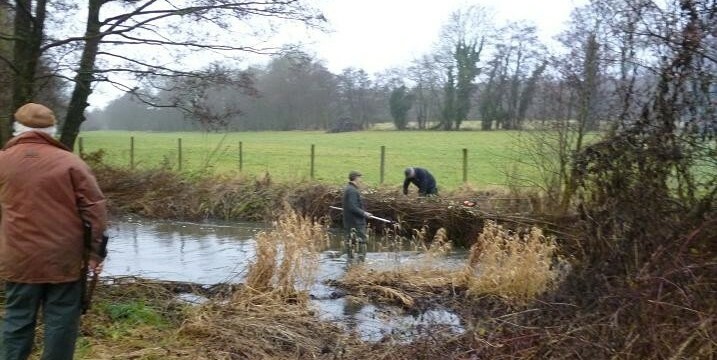 2016 had seen a collapse in the fishing on this Hampshire chalkstream, a report of trout left stranded in a field following floods, big pike, mink, crayfish, plus major work by the farmer to construct a new bridge and build up the banks, had all combined to give new members a very negative impression of this once prolific fishery. 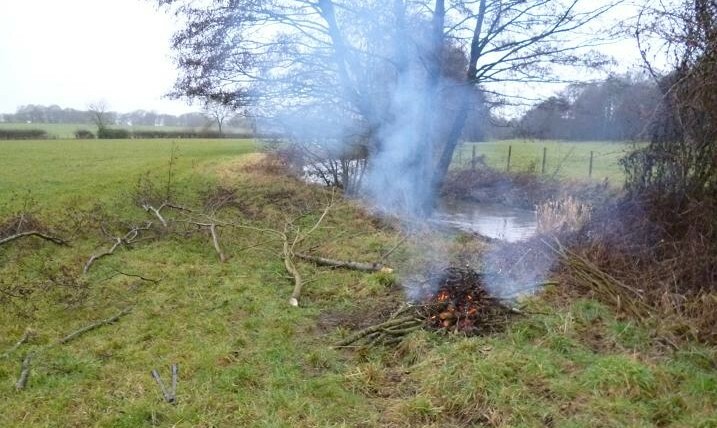 With only four of the thirty members available on such a dour, drizzly morning, we decided to carry out some tidying up work on the upper stretch, starting with a flow deflector that had been planted using fresh willow cuttings a few years before to stop bank erosion, where there had been a cattle drink. 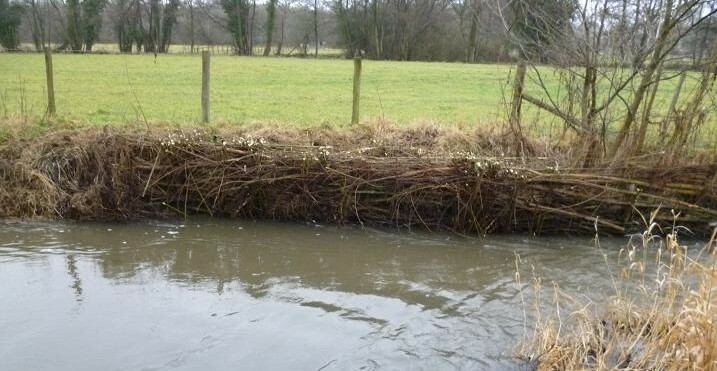 Willow will throw out roots into any wet surface, the cuttings, pushed vertically into the gravel, have grown to form a solid living barrier, that has been laid like a hedge, speeding up the river, which has in turn gouged out a deep fish holding run from the once shallow gravel. Untouched for a couple of seasons, these alders were in need of a severe haircut with the chainsaw to allow easier casting and fewer lost flies, while the team also cleared underwater obstructions. Dragged to a central point, the trimmings soon began to pile up, but a fire, started despite the miserable wet conditions, was soon burning furiously, acting as a focal point for an impromptu warming coffee break. Talk of an electrofishing survey in the coming months, when any pike caught could be relocated, followed up by a plan to restock with brown trout on a piecemeal basis throughout the season, was encouraging news. Pest control had also accounted for fifteen mink and about six thousand invasive signal crayfish, the only down point on a positive day, being that the chief bailiff had forgotten to bring any potatoes to bake in the ashes of the fire. Maybe at the next working party? Knowing that a couple of old friends would be fishing at Jeane’s pond in nearby Braybrooke park today, I’d hoped to join them for some roach fishing, but a couple of prior engagements saw the morning slip away into the early afternoon, with an hour’s plug fishing my only opportunity to catch. A cold morning with a chill wind, had given way to a bright mild afternoon, but my friends were gone, no doubt undertaking their grandfatherly duties on the school run. Pegs one and two showed evidence of recent occupation, it not taking Sherlock Holmes to see a scattering of liquidised bread and the odd dead red maggot on the bank, that the local pigeons and sparrows had yet to clear up. Detective work over, I set up my ancient seven foot split cane spinning rod and ABU 506 reel, attaching a 70 mm Rapala Countdown sinking plug in the hope of hooking a pike. On their last visit to the pond, my now absent friends had complained of a pike attacking roach, as they brought them in, the carnivore attracted to the silver fish activity. Visiting the next day, a pike had taken my lure on the drop, while casting around these same pegs, but had failed to set the hooks in it’s bony mouth. Now possibly less that an hour after their visit, there was every chance of another pike, but my efforts around the two pegs drew a blank, despite the plug giving an award winning impression of a sick and dying roach. Walking round into the shade, I saw a small fish jumping like a skipping stone across the surface, close to a bankside tree. A clear sign of a predatory fish chasing it’s supper, I cast the plug to drop among the ripples and retrieved. The tip pulled round and I struck in an instant. Dead weight. A small branch came to the surface, then dropped off at my feet. 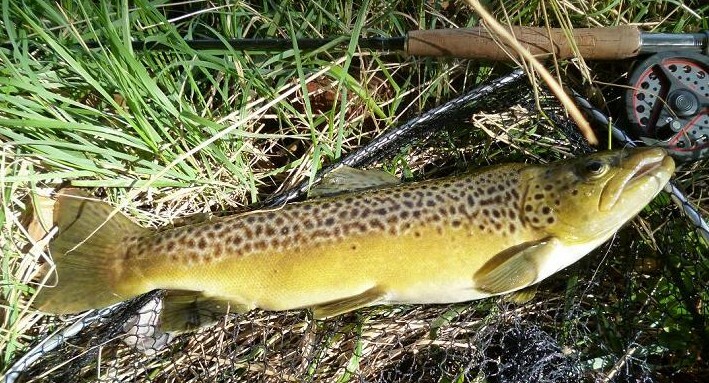 This snaggy spot was worth another cast, or two. Minutes later the tip bounced round with a proper take. It was a fish, but not a big one, that pulled deep into the pond without too much resistance, if a pike, it was a baby; all being revealed as a 4 oz perch surfaced, shaking it’s head ten yards away. 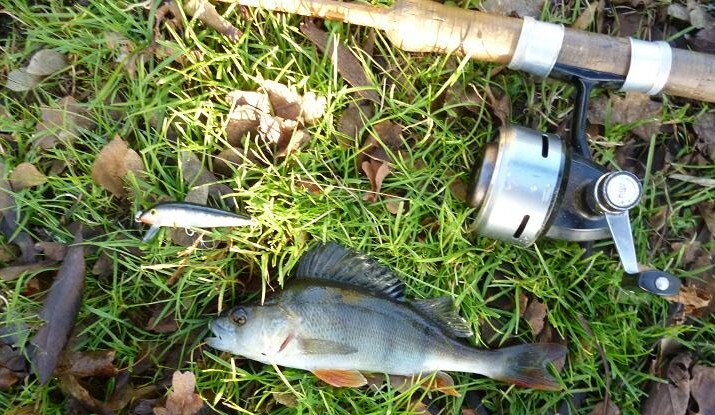 Neatly hooked in it’s bottom lip, the barbless was out in a second, this little perch happy to take on a fish one third of it’s size. A few casts later, the rod tapped on the retrieve and another small perch jumped clear throwing the hook. I had a smaller Rapala in my bag, but decided to soldier on. Moving round to cast into the area from the other side, boils behind the lure indicated another fish chasing, but not taking. The regular anglers speak of large perch in this pond, but none showed today and after another half hour’s entertainment with no sign of a pike, I was ready to face the rush hour traffic. 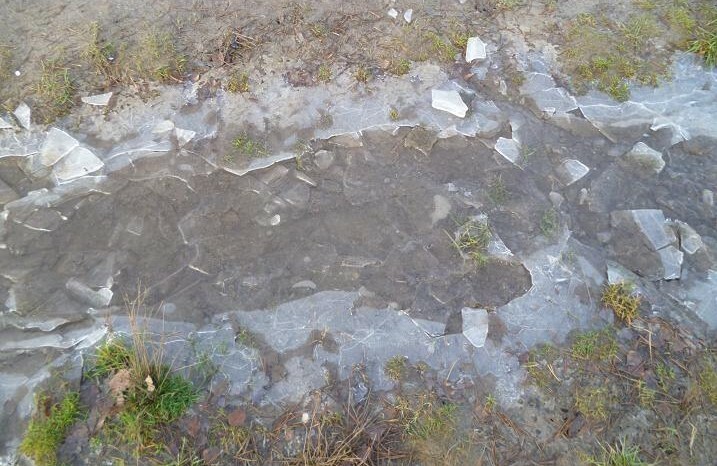 When a friend suggested a post Christmas fishing session on a usually prolific local pond, I took the precaution of walking down to check it out, finding the surface covered with a thin layer of ice. Relaying the news to my friend, he decided to cancel. The following day saw heavy rain, then an overnight frost, but bright morning sunshine promised a dry day and I decided to venture out for a few hours after lunch. By mid morning, clouds were scudding across the sky, driven by a bitter wind from the north and my wife was questioning my sanity again, as I loaded up the fishing trolley for the short walk to the pond. The sight of frozen puddles along the path did not bode well and when I reached the pond, sheets of ice were spreading out from the margins toward the middle, but the far end was free of ice, kept open by ducks, although it was rippled by gusts of wind. So far my investment had been to take liquidised bread and some punch slices from the freezer, plus a five minute walk, which with thermals and several layers of clothing had got me warmed up nicely. Circling the pond, I found a spot with the wind and “sun” on my back and set out my stall to give it a go. If it was no good, home was not far away. Only problem was that there was a traffic cone, courtesy of the local yobos, on it’s side ten feet out. Using my landing net pole, I managed to roll it round to sink in deeper water, just beneath the surface. Out of sight, out of mind. In summer, a lily bed stretches out from the right, an escape route for the larger carp of this pond, but today only a few died back stalks were visible and I threw a few balls of bread along it’s edge. In summer this would have resulted in a boil of small rudd attacking the ground bait, but the surface remained undisturbed apart from the wind. Selecting a small 2BB waggler pole rig with a size 14 barbless, I was soon ready to fish, a 6mm bread pellet swung out on the 7 metre pole, being taken on the drop by a palm sized rudd. 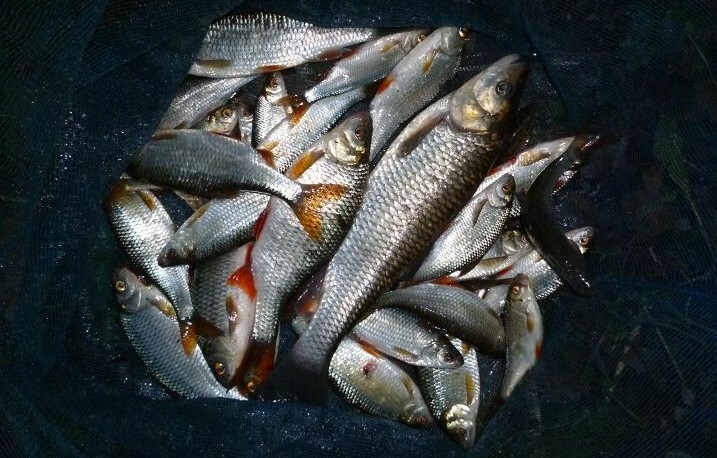 The rudd here vary in colour from the usual silver with bright red fins, to greens and gold flanks with matching fins. The bread punch was proving again to be the best cold water method, the float following the bait down each cast without hesitation. 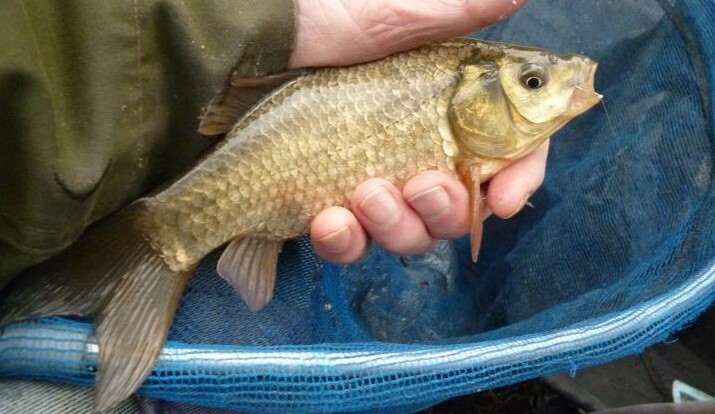 The next fifteen minutes saw rudd swinging to hand in a steady flow, before a steady sink of the float had the pole elastic extending beneath the surface, when a small common cruised off with the bread. A quick dive into the lily bed was countered and the pole shipped back behind me, the top two removed to play the hard charging carp to my waiting landing net. The hook dropped out in the net, the all important elastic doing it’s job to stay in contact with the fish. There are much larger carp in this pond, but this one would do very nicely for a starter, the reign of the rudd being over from this point onward. Bubbles were already appearing on the surface, a sign of crucian carp and my next cast had the bright yellow float tip, which was dotted down to the surface, flashing off and on, as it bobbed up and down with a bite. 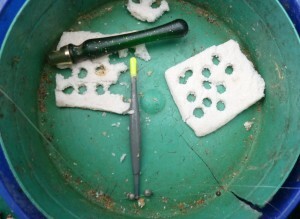 The No 8 shot four inches from the hook was lifted by a fish, revealing more float tip. 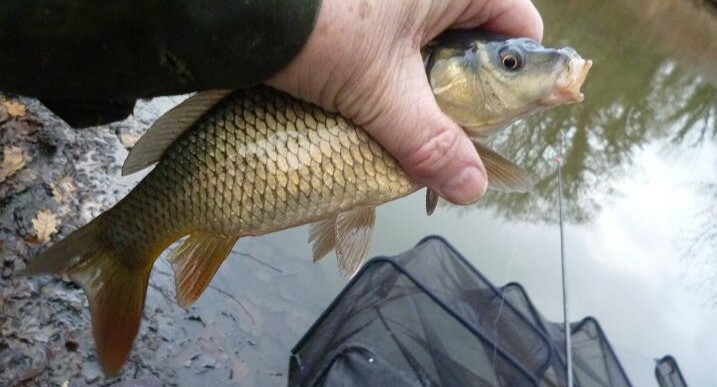 I struck and felt the weight of a nice crucian, before it began it’s erratic fight, again shipping back instantly to the top two lengths of pole, letting the elastic do it’s work. Not a crucian carp, but an exotic looking fan tail with extended fins, this barrel shaped fish hugging the bottom all the way to the net. The wind was still gusting behind me, making bite recognition difficult, the float appearing and disappearing in the ripples, each time it failed to show, I lifted into another fish. The small pond is full of hybrids, this fan tail having more common carp in it than crucian, although the next carp was definitley a crucian….I think. An hour into the session, the cutting wind dropped, but the sky went black with a cloud and the first of several short bursts of rain hissed on the surface. My hood was already up over my cap from the wind and felt cucooned from the elements, each shower passing in minutes, causing only slight discomfort. The bites had slowed since the rain and I plopped another ball of bread out in front of me, putting the float in close to the cloud of crumb. It zoomed off, followed by the elastic, another common was fighting for freedom. 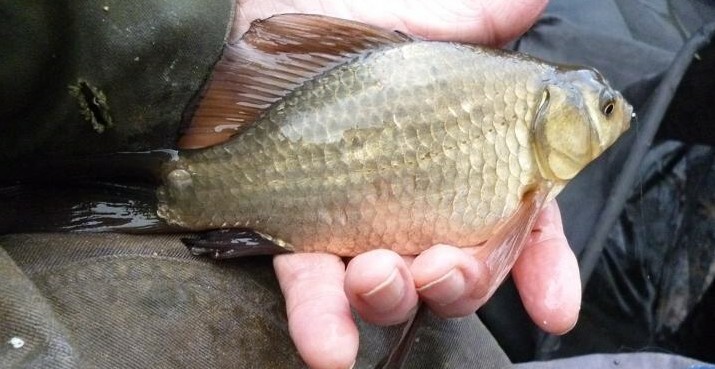 The common carp were now outnumbering the crucians, each one stirring up the black mud as they fought, which seemed to attract more into the swim, this smaller common making an unsuccessful dash for the lilies. Taking a detour on her walk to shop at Tesco, my wife appeared by my side, just as I netted another common this one close to a pound. I was now into my third hour, longer than I’d expected, the wind and rain had gone, but the clearing sky had dropped the temperature and the chill was creeping into my bones. Reaching into her handbag, she found an After Eight mint to help see me through this fish catching spree and then returned home to make me a flask of tea. What a woman! I scraped up my last ball of crumb and put it in. The bites had not slowed, in fact the float gave bite indications the moment it settled, but they were more fussy, not coming to a conclusion fast enough for me. I began striking at any positive movement, a lift, or dip. I hit most, missed a few and lost a some, including a pole bending common that came off at the net, that would have taken the hook in further, if given more time. These heavily coloured crucians were the main culprits of the dithering bites. They would attack the bait on the drop, then sit off the bottom doing nothing with the bait in their lips. I was catching these, almost by numbers. Cast in, wait a minute, lift, break down the pole and net. So lightly hooked, they all needed netting. Being tempted to swing them in, often resulted in a dropped fish. 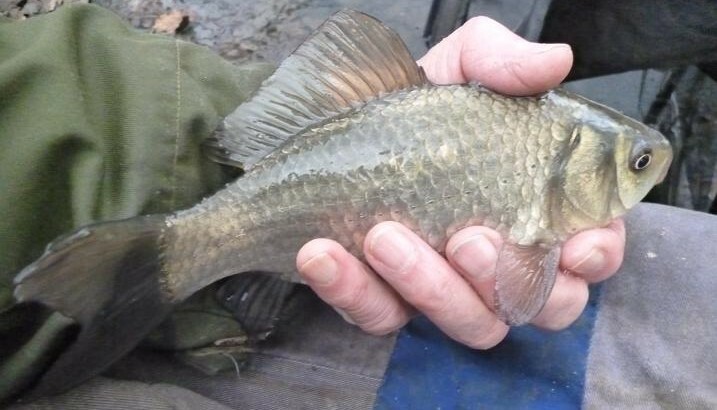 I was pleased to see this small tench. I don’t know how they got into the pond, but they are getting bigger each year, this the best yet. My wife arrived in time for the netting of yet another fan tail crucian, the welcome cups of hot tea spurring me on. With time now denoted by fish, she stayed for a few more, before continuing to the shops. Having worked in a factory during my life, the fish were coming as though on a production line, getting into a rhythm only slowed by the size of fish. 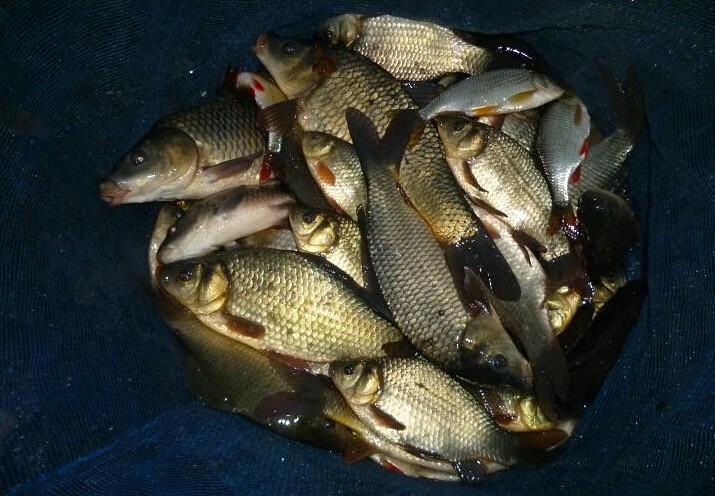 I’d lost count of how many caught, but my bait box told the story, each punch of bread being a fish. As 4 pm approached, the float dipped under and I hooked into the best fish of the day, a common of well over a pound, that ran toward the middle, before giving into the pressure of the elastic. The light was now fading fast and made this my last fish, unclipping the rig from the pole, before I could be tempted to go on. 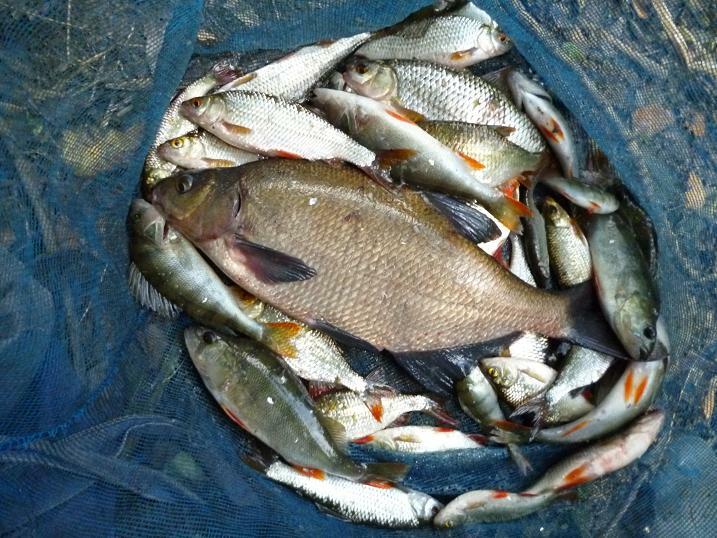 The session, on a day, during the coldest week of the winter, topped all my expectations, this being confirmed when I lifted the keepnet from the water. For a non commercial local pond, this was a fantastic haul taken in under four hours. 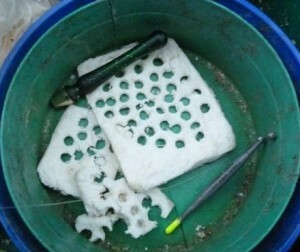 It bounced my usual scales, which go up to 6 kg, so rooted in my box for my 50 lb scales, managing to hold the net up long enough to see the needle stop just short of 20 lb. Bread punch rules.